Kuopio is a city and a municipality located in the region of Northern Savonia, Finland. Visit St. Nikolaos Cathedral and Lutheran Cathedral for their historical value. Step off the beaten path and head to RIISA - Orthodox Church Museum of Finland and Riuttala Farmhouse Museum. Explore Kuopio's surroundings by going to Venajanhiekka (in Rautavaara), Leppavirta Church (in Leppavirta) and Tahko Farmi (in Tahkovuori). 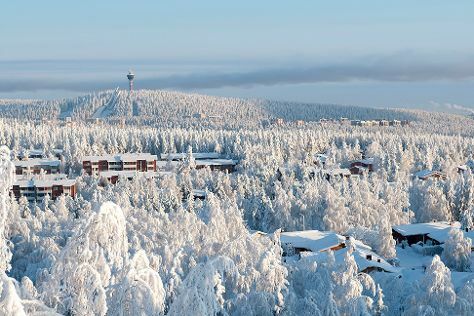 And it doesn't end there: contemplate in the serene atmosphere at New Valamo Monastery, explore the activities along Valkeisenlampi, enjoy breathtaking views from Puijo Tower, and test your team's savvy at popular escape rooms. To see reviews, more things to do, maps, and more tourist information, go to the Kuopio attractions planner . Singapore, Singapore to Kuopio is an approximately 23-hour flight. The time zone changes from Singapore Time (SGT) to Eastern European Time (EET), which is usually a -6 hour difference. Plan for colder temperatures traveling from Singapore in March, with highs in Kuopio at 0°C and lows at -7°C. Cap off your sightseeing on the 17th (Sun) early enough to go by car to Savonlinna. Explore hidden gems such as Linnansaari National Park and Kolovesi National Park. Your cultural itinerary includes sights like Pikkukirkko and Kerimaki Church. Get out of town with these interesting Savonlinna side-trips: Heinaveden kirkko (in Heinavesi) and Salpa Line (in Kerimaki). The adventure continues: explore the historical opulence of Olavinlinna Castle, take in the architecture and atmosphere at Savonlinna Cathedral, examine the collection at Lusto - The Finnish Forest Museum, and appreciate the history behind The Spirit of the fortress. For other places to visit, traveler tips, more things to do, and more tourist information, you can read our Savonlinna trip builder tool . You can drive from Kuopio to Savonlinna in 2.5 hours. Other options are to do a combination of train and bus; or take a bus. March in Savonlinna sees daily highs of 1°C and lows of -7°C at night. Finish your sightseeing early on the 21st (Thu) so you can drive to Mikkeli. Mikkeli is a town and municipality in Finland. The Astuvansalmi rock paintings and Mikkeli Rural Parish Church are good opportunities to explore the local culture. Get outdoors at Lietvesi Scenic Road and Neitvuori. Venture out of the city with trips to Pirtin perinnepuisto (in Kangasniemi) and Puumalan Lake (in Puumala). And it doesn't end there: examine the collection at Infantry Museum, do a tasting at Ollinmaki Winery, explore the world behind art at Mikkelin Taidemuseo, and stop by Mikkeli Market Place. For photos, other places to visit, maps, and more tourist information, refer to the Mikkeli tour planning site . Drive from Savonlinna to Mikkeli in 1.5 hours. Alternatively, you can take a bus; or take a train. In March, daily temperatures in Mikkeli can reach 2°C, while at night they dip to -8°C. Finish your sightseeing early on the 25th (Mon) so you can travel back home.